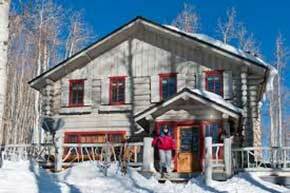 Twenty-one years ago, Beaver Creek’s founders dreamed of building a perfect alpine ski village. Their work is finally done, and ah, what a skier’s paradise it is. Next February, Beaver Creek will cohost the World Alpine Ski Championships, ski racing’s most important event after the Olympics. When the world tunes in to watch elite international racers compete on the resort’s fearsome new downhill course, the Birds of Prey, they’ll see firsthand what avid schussers have known all along: behind Beaver Creek’s cosseting facade is a superb ski mountain–made even better two years ago with the completion of the country’s first true village-to-village skiing interconnect. Now, through a combination of lifts and trails, skiers can explore three distinct resorts–Beaver Creek, Bachelor Gulch and Arrowhead–which comprise 1,625 acres of skiable terrain. To top it off, last year resort management pumped a whopping $17 million into completing the village core. Among the highlights: two splashy retail centers/luxury condominiums, a $15 million arts center, an ice-skating rink (with its own Zamboni) and four sets of covered escalators. When longtime guests return this season, the first thing they’ll notice is what isn’t there: construction cranes marring the skyline. Finally, twenty-one years after the initial groundbreaking and just two years shy of the millennium, North America’s quintessential ski resort is all grown up. And what a coming-of-age it’s been. After all, this is the resort that put the word plush before every condo; that gave skiers on-mountain alternatives to lukewarm burgers and greasy fries long before the rest of the ski world caught on; that built a base village with heated walkways, a private club for homeowners (complete with concierge service) and a luxury hotel with a ski valet, so that at the end of the day all guests have to do is stand there while some friendly young person from Iowa or Ohio not only bends over to pick up their equipment but presses the release lever on their bindings in the process. From the start, Beaver Creek was designed entirely with the guest in mind. It was the dream of Pete Seibert, a Massachusetts native and former Tenth Mountain Division skier who trained during World War II at nearby Camp Hale. Seibert, who also founded Beaver Creek’s sister resort, Vail, envisioned a European-style resort that borrowed heavily from picture-perfect spots like St. Moritz and St. Anton. At the time, his ideas were revolutionary: build a car-free village at the base of a mountain so that skiers could immerse themselves in the overall alpine experience. Trails would be cut with an unheard-of sensitivity to the environment; the architecture would blend into the surroundings, using plenty of native wood and stone; there would be lively gathering spots for apres-ski, an ice-skating rink, even an arts center. In a perfect world, Seibert thought, there would even be village-to-village skiing like that at the popular Arlberg resorts of Lech and Zurs. When the resort finally debuted in 1980, with four lifts and twenty-eight rum, the village was still years away from completion. On opening day, guests had to pick their way through construction sites and put on their ski boots in an rotatable tennis bubble instead of the planned post-and-beam base lodge. Adding insult was a severe lack of snow. It was hardly an auspicious start. Yet early on the area attracted a high-profile clientele, including President Gerald Ford, who first previewed the place during a preopening Sno-Cat ski tour.”We literally fell in love with Beaver Creek right then,” recalls Ford, who was among the first to buy, land for a vacation house. Today, the Fords’ neighbors include international businessman Alberto Vilar; Apollo Advisors CEO Leon Black and his wife Debra; Peter and Leni May, donors of the new May Gallery; and Randy Tobias, chairman and CEO of Eli Lilly and Company, and his wife Marianne. Despite the countless setbacks, development at Beaver Creek continued; in 1990, Grouse Mountain opened with 110 acres of challenging bump rum. It wasn’t long before locals, fed up with the weekend crowds at Vail, began turning up at “the Beav” to ski themselves silly on thigh-burners like Ptarmigan, Screech Owl and Bald Eagle. They discovered secret powder stashes long after the last storm had swept through the valley and even learned to appreciate the merits of groomed corduroy, a craft–leaving trails as soft as pressed powder–in which Beaver Creek’s Sno-Cat operators excel. Meanwhile, vacationing families, initially drawn to Vail because of its superior children’s programs, also began heading straight to Beaver Creek, where the condominiums were new and nicely furnished, the terrain was suitable for all ability levels, and another topnotch children’s program produced confident downhillers. While it’s true that there are bigger resorts (Vail, Whistler/Blackcomb) and, some would say, more authentic resorts (Aspen, SunValley), none does a better job of combining terrain, amenities and services. Rising to a summit elevation of 11,440 feet, the mountain’s 1,625 skiable acres spread across four peaks. At any given moment during the day, skiers have a choice of long, ballroom-smooth cruisers; gladed steeps; fierce, double-black-diamond bump runs; vast bowls; and slow-skiing and family-skiing areas. There’s even a snowboarders’ half-pipe. (Not that this is a breeding ground for kids with nose rings. Quite the opposite. In fact, if fashion designer Willy Bogner could imagine his dream clientele, this is where he’d find it.) With six of the fourteen lifts high-speed detachable quads, lift lines are nonexistent. Skiers can get a day’s worth of vertical under their belts in a couple of hours. Which means there’s plenty of time to enjoy the rest of the resort–just as the founders intended. Besides ice-skating in the village, there’s sensational cross-country skiing and snowshoeing at McCoy Park Cross-Country Center at the top of Beaver Creek mountain; dogsledding and horse-drawn-sleigh rides; shopping in boutiques like Gorsuch and the Golden Beaver; even a Western night for kids featuring the Buckaroo Bonanza Bunch and wagon-wheel pizza. And, of course, there’s the new Vilar Center for the Arts (whose major donor was Alberto Vilar), a 530-seat, pine-paneled theater with acoustics to rival Carnegie Hall’s. During its first winter season, the center’s popular performances ranged from the sublime (the Guarnier Quartet) to the satirical (Les Ballets Trockadero de Monte Carlo). All this activity, on the mountain and off, makes for some pretty hearty appetites. Between runs, locals flock to Gundy’s Camp (all numbers are in area code 970), at the base of the Bachelor Gulch Express Lift, for the best, smokiest barbecue in the valley, or to Red Tail Camp, at the base of the Grouse Mountain Express Lift, for, among other things, the whiskey brisket sandwich. Spruce Saddle Lodge, at midmountain, has a giant dining court with everything from super salads and grilled bratwurst to picture windows that look out at the Gore Mountain Range. At the base, the new Rendezvous Bar & Grill offers a prime slopeside setting along with butternut-squash bisque and rosemary-grilled lamb. Hands-down, the most coveted luncheon invitation is to Beano’s Cabin, a private eatery for Beaver Creek Club members and their guests. Built on a sunny plateau and shielded by lodgepole pines, Beano’s is the epitome of cowboy chic: leather dining chairs, some with visible cattle brands, bent-twig barstools with pony-hair cushions, a two-story river-rock fireplace. Chef Joe Keegan, an alumnus of New York’s Quilted Giraffe, consistently surprises and delights his patrons with such whimsical dishes as caviar beggar’s purses, a BLT made with pancetta, tomato and mozzarella, and the ever-popular “Very Tall Seafood Salad.” At night, Beano’s is open to all for dinner; a roundtrip sleigh ride and five-course meal costs $65 to $85 per person. Apres-ski, one of the most popular gathering spots is the Hyatt Regency Beaver Creek Resort & Spa, at the center of the village. Skiers like to sip toddies around the outdoor firepit or, if it’s snowing, inside in one of the deep kilim-covered easy chairs. From there it’s a short stroll to Toscanini, a new Italian restaurant next to the skating rink, which specializes in pasta and wood-fired pizza and an amazing baked chocolate-cappuccino mousse for dessert. The most popular restaurant among the ankle-biter set is the casual Blue Moose, which creates pizza with eclectic toppings such as pineapple and smoked chicken.